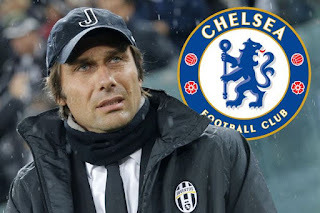 Home latest_News sport CONTE SAYS BYE TO CHELSEA ? CONTE SAYS BYE TO CHELSEA ? The news emanating from Stamford said that Chelsea have reportedly agreed compensation terms with manager Antonio Conte and his backroom staff as they close in on a new boss. It states that the Blues are on the verge to appoint Maurizio Sarri as their new coach in less than 24hours from now after reaching a £9.5million agreement to terminate the contracts of Conte and his coaches. Maurizio Sarri is said to succeed his fellow Italian at The Bridge after Antonio Conte failed to qualify for Champions League football in what was a poor Premier League title defence from the west London outfit. The Italians future at Chelsea has been in shadow for some months now, with former Paris Saint Germain Manager Laurent Blanc, former Barcelona coach Luis Enrique and Real Madrid former Manager Zinedine Zidane all being linked to take Contes’ place. Chelsea despite unable to defend their premier, later finished the season on a high by beating Manchester United in the FA Cup final at Wembly, but their fifth-placed league finish is what has ultimately cost Conte his job. Maurizio Sarri is determined to get to work immediately, as the Blues step up their interest in summer transfer targets, although one of his first task at Stamford Bridge will be trying to stop top stars like Eden Harzard, Thibout Courtois and star midfielder N’Golo Kante to leave.